The Chapter start with the Village getting ready to receive the attack of the Nargacuga, Dan and the other Riders are at the front waiting for Nole to return, and he does, severly damaged… The Nargacuga is coming. Meanwhile Lute and the others have finally returned and they are informed about the situation, which is that the Nargacuga has the village as it´s objective and for that the Riders will be in charge of defending the village; the mission for Lute and the other apprentices are to make sure that everyone has taken shelter. In their way back they see the second line of defense which is made of the village elders who where Riders, so they know how to handle a monster! Finally our heroes have reached the shelter and Cheval´s Mom is there, she was worried for her offspring and his friends, still Cheval tells her about their adventure and the fight against the Arzuros. Lute is confident that just as they did the job with the Arzorus, the Nargacuga will be the same! In any case Lilia goes to see her family and it seems that the Kometa twins are still in their house since their parents are away. So for that Cheval, his Mom and Lute go for them. While they go, Cheval say that his Mom´s flower bed might get ruined, she responds saying that it is no biggie, she will just plant more and those will bloom again. Lute remembers a day when he was little and just recently entered in Cheval´s house, Cheval´s Mom planted some flowers in honor for Lute, flowers that represented the day where Lute became part of their family… Indeed, in his eyes Cheval is the closes thing to a brother and his Mom is the closest thing as a mother for our Main character. They finally reach the Kometa´s house and the kids are there and theya re ready to fight, they at first didn´t wanted to come until Cheval´s Mom convinces them to go and protect everyone from inside the shelter. Thing that they agree with! Lute and Navirou take the kids to the shelter while Cheval and his Mom goes to pick some ingredients since she will take care of the food for everyone. They grab the things and Cheval makes sure that the Rathian egg is safe, since it is still his secret and the future partner for Laeus. So it is a surprise and something of himself and by himself. Meanwhile Lute and Navirou has made the Kometa kids to go to the shelter. Mille receives them and tells them that surely they took their sweet time. In any case inside the shelter Lilia tells Lute that her family is Ok, mad at ther for making them worry; but oh well. Cheval and his Mom have finally come and the dinner will be prepared by everyone, something delicious, quick and easy like some soup or something; at the same time Lilia will be making energy drinks for everyone…too the displeasure of Navirou. Lute and the rest of the Riders apprentices are peeling potatoes and Navirou says that everything is calm, more than usual so it doesn´t look like a state of emergency; in any case if the Nargacuga comes Lute is decided to fight him! Mille enters the conversation and says that this isn´t a game; but a very serious matter. Hyoro even wishes that the nargacuga just go away, still… If the time comes and he has to fight him, he will do! Mille, Cheval and Lute congratulate the bravery of his friend! Suddenly the peace is broken by the roar of the Monster, the Nargacuga is coming closer and closer. The experience Riders lead by Dan are ready to face this monster! Dan brings the apprentices and tells them that the experienced Riders will go and face the Nargacuga in the forest; with luck they will be able to defeat him there. If they fail and the Nargacuga comes closer, what they must need to do is a Plan especially made by Dan. Lute and the others are ready for their task while Dan, Genie, Stone and Nole goes to the action! Lute detects something in Dan… He left his motto “In top form” now, in truth he must be feeling the pressure for this menace. Dan and his group are in the forest, in order to cover for more ground they decide to separate. Stone is a lone with his Popo, suddenly he looks at the sky and the Nargacuga is in there and attacks him! Nole hears Stone´s scream and yells at him asking him if he is alright!? Suddenly he looks in front of him and the Nargacuga is already on his face and attacks him! Genie goes to save his friends in need; and with a single attack of the Monster tail he gets defeated! Dan then goes to fight the monster! He avoids the first attack of the Nargacuga; but the monster throws his spike tail and damages both Dan and the Qurupeco, defeating both! Lute´s team is ready, although Mille fears the worst for Dan and the others; Hyoro tells her to not to say such thing! In any case they see the Nargacuga and this has look at them back. The fight is going to start against him! Navirou is very afraid; but Cheval tells everyone that they just need to attach themselves to Dan´s plan! Lute tells Navirou that they must do their part; Navirou is very afraid and doesn´t want to do anything besides running for his life, still Lute convinces him telling him that he is needed AND he needs his navigation skills! The hunting horn is heard by the ears of the Nargacuga, it directs to a more or less far part of the bridge that leads to the village, in a little hill; Lute and Navirou are waiting for him and yelling and making sounds with the Hunting horn. The Nargacuga goes to where they are and screams! The Nargacuga reveals himself! Nargacuga, the swift wyvern! This monster is known for his agility and his near-like Ninja skills! It can attack using it´s wings like blades and his powerful tail that can enlarge to cover more distance! This Nargacuga in particular has been infected by the black blight, so not only he is more powerful; but has gone berserk! The Nargacuga runs with al his might to attack Lute and Navirou. Both goes away and the Monster has fallen since the little hill was a trap! A classic move used by Hunters! Navirou gives the signal to the other Riders and Cheval, Mille and Hyoro ride their monsties and go to where Lute and the others are. Everyone starts burying the Nargacuga, they are going to bury him alive! The Nargacuga gets out in a big explosion damaging Cheval, Mille, Hyoro and their Monsties! The Nargacuga starts running towards the village and Lute calls for his Rathalos! The Nargacuga reaches the second line of defense and the elders threw him flash bombs; but to no avail. The Nargacuga keeps his rampage and starts destroying the houses and everything! 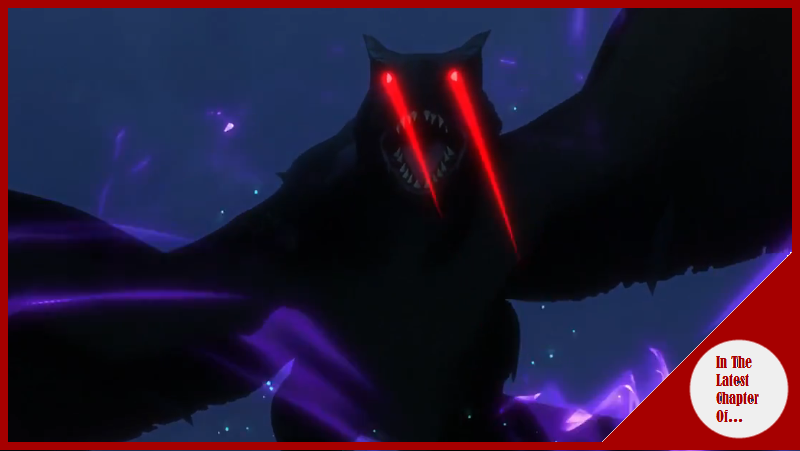 The emergency call is given and the news is spread, the Nargacuga has entered the village and it´s destroying it! There is no reason why he is doing it, the Black Blight has made this monster crazy with rage and a total berserk… He just destroy things for the sak of destroying them. By hearing that, Cheval´s Mom runs towards her house, there is something precious for her son that it needs to be preserved! The townsfolk gets out of the shelter and goes to try to attack the Nargacuga with what they have at their disposal! Finally Lute and Laeus have reached the Monster and start attacking him! The villager threw to the Nargacuga some smoke bombs, which make the Nargacuga to keep in his destroying spree destroying various houses on the way! Cheval, who was checking his Velocidrome, see the destruction and runs towards his house in order to retrieve the egg! Lute finds Cheval´s Mom and tells her to get back to the shelter; but she denies and says that there is something in her house that she needs to grab, after that she goes back to running! The Nargacuga sees the Rathalos and attacks both Rider and Monstie, still Laeus is able to avoid such attack! And the chasing continues! Cheval´s Mom has finally reached her house and looks relieved that the egg is ok.
Dan and Genie throws some flash bombs to the Monster who keeps running, the experienced Riders will keep pursuing it! A very good chapter all around! First of all, sorry that this came a day later. Life got in the way and I wasn´t able to work in it until yesterday late at night and today´s morning. Still going back to the chapter I was expecting a little more; but I´m satisfied none the less. Called it! I knew that a tragedy was coming, and Cheval will be the one who will suffer from it, and while I feel bad for the kiddo I think this will be a turning point in the story and the character of Cheval, who now has lost his Mother and he was unable to do anything in order to help her. The emotional impact however had a very good build in this chapter and the past one regarding the fate of Cheval´s Mom, which it is a very sad one. The only negative it is that it´s not quite well explained at first, like it just happened and the building destroyed was just an empty house, so it is a little confusing to know at first moment what happened until Lute´s reactions tell us everything. At the same time now it is time to Cheval to awaken his Rathian and get a proper revenge against the Nargacuga who has done so much damage to the village and himself! Especially because he won´t let his Mother´s sacrifice to go to waste.